Let the flowing forms in nature be your inspiration in this design exploration workshop. Land, water, sky, rocks; details in leaves and wood can all be starting off points for this process. Line is the focal point of design in this workshop. Warm up exercises are planned to build your confidence in piecing, color, value, and design skills. Then the emphasis will be on the planning and execution of an original design focusing on a color palette that excites you using inspirational photos that you have brought along. In the end you will have documented your journey in a journal like format and created a one of a kind quilt. New material will be presented each day for ideas and inspiration for present or future projects. 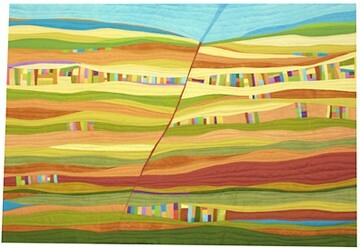 Journey to Inspired Art Quilting and Intuitive Color and Design book are good references.